The former Beatle also acknowledged and paid tribute to the late Chuck Berry during the interview. Berry was a major influence on McCartney and he told of a meeting between the two. “He came to one of our concerts when we were playing in St. Louis, which is his hometown. And he came round backstage. It was great to meet him and just be able to tell him what a fan I was. When I think back to being in Liverpool pre-Beatles, when we were all just kids learning the guitar with the dreams of the future, we suddenly heard this little thing, Sweet Little Sixteen. We never heard anything like that, and then when Johnny B. Goode came along, all of his fantastic songs, Maybelline. All these songs about cars, teenagers, rock ‘n roll music, was just so thrilling. It was a world we didn’t really know existed because in actual fact, in Britain it didn’t. This was new, coming in. You can’t imagine a time when ye olde rock ‘n roll was brand new. But it was. There it was coming at us, so you can imagine what a thrill it was when you’d never heard anything like that. People who have heard it all before now because it’s history now still love it. But imagine just never having heard it before. Bang! Sweet Little Sixteen comes at you. So he was a huge influence on us and we copied a lot from his guitar style as did Keith Richards and people like that. I always saw him as a poet. His lyrics, to me, are like American poetry. They capture that sort of high school stuff, rock ‘n roll and the cars and just fantastic. McCartney concluded the interview by plugging his upcoming tour in Japan. 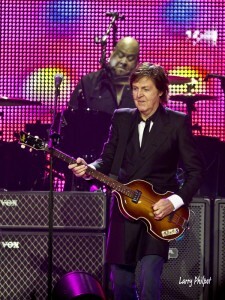 A release date for McCartney’s upcoming album has not been scheduled. You can LISTEN HERE to the entire interview.